Brett Nordgren and Dave Nelson's discussions of their vertical seismometer sounded very interesting in the time period of around August 2008. The ability to achieve a broadband response from 50 seconds to 20Hz or so was too enticing to resist. I liked the idea of feedback but their design required many machined parts and I did not have access to an end-mill or know how to use one. So why not put feedback on a seismometer that could be built using only a drill press and band saw. The Inyo FBV is nice and compact with a beam mass of about 150 grams and requires a magnet/coil design of about 15 N/A (Newtons/Amp). The vertical design I had in mind would be larger with an estimated beam mass of 300mg, . The larger mass means a magnet/coil design with a higher N/A. Next step was the magnet design process. 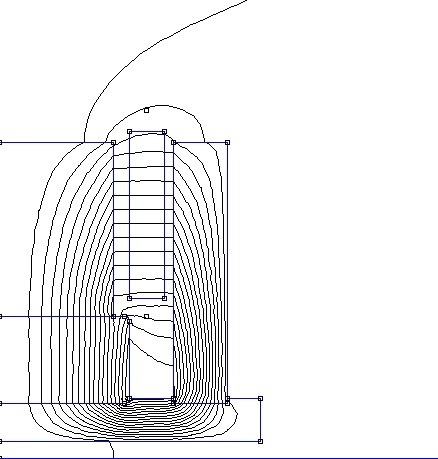 Magnet design was achieved using the software tool FEMM. This is a no cost application for designing magnets. It is easy to use. After about 24 iterations while adjusting various physical parameters, design 18 was chosen as the design to use and build. The mechanical description is shown. The magnet/coil design achieved 45 N/A. The magnet center-line is on the left side of the drawing. 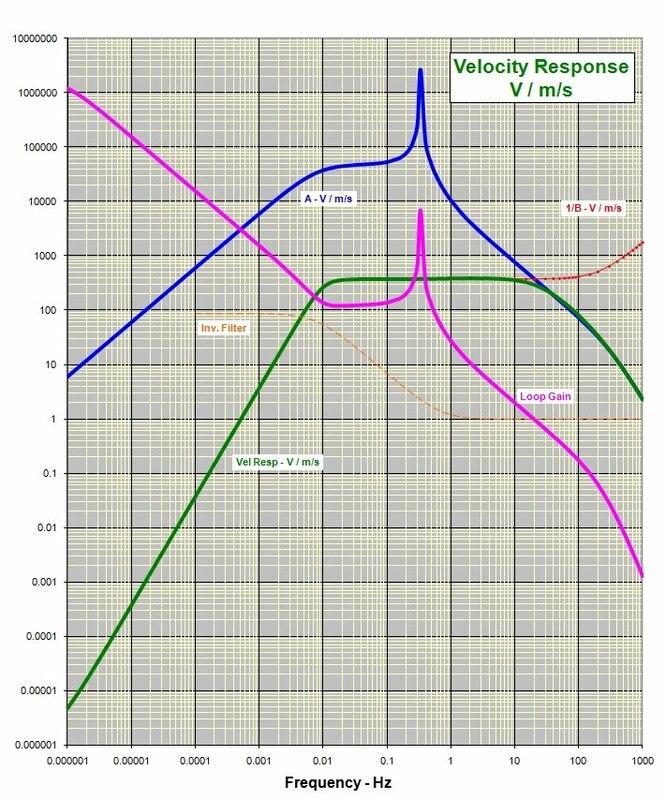 The flux diagram showed a good uniform flux in the air gap. The flux density along the air gap is shown. Keep in mind that the Inyo FBV seismometer does not need a magnet/coil assembly with a N/A of 45. A value of 15 is all you need. The coil design called for 1200 turns of 30 gauge wire. The magnet and coil were built and then tested to confirm the design. The coil was attached to the beam of the vertical seismometer. The measurement setup consisted of a power supply, volt-ohm-meter (VOM) and a weight probe. 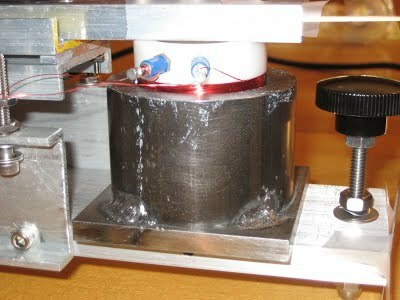 The seismometer beam and magnet were adjusted to make sure the coil could move freely in the magnet. The beam position was carefully noted with the coil open-circuited and no extra weight on the coil. Next a defined weight of 28.6 grams was placed on the seismometer beam and immediately above the center of the coil. The coil was connected to the power supply and in series with a 1000 ohm resistor and to allow easy adjustment of the current. The VOM was also in series with power supply and coil to measure current. Power supply voltage was adjusted to bring the seismometer beam back to the original rest position without the weight. Current required to move beam to rest position was 6.60 mA. Raising the coil rest position reduces the N/A value to 38.4. 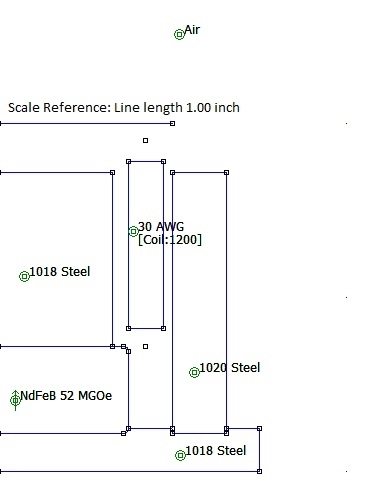 The measurement confirms the magnet and coil design. Next check for any system resonances. The seismometer coil was connected to a Hewlett-Packard 203A function generator. A series 1000 ohm resistor was added to provide a high impedance load to the function generator. One channel of the 2 channel oscilloscope monitored the function generator voltage and the other channel was used to monitor the voltage across the seismometer coil. The frequency of the generator was slowly scanned from 5Hz to 500Hz. Now the frustration part. The system resonated at 250Hz. The Q was fairly high. Voltage across the coil increased by a factor 2 or 3 and I could hear the resonance and feel the beam vibrate. Over several experiments including cutting beam length, seismometer spring, etc. I concluded that this form of Vertical Force Balanc seismometer would not work without many problems. Follow the Inyo FBV seismometer design. Brett put together a very nice isometric drawing of their FBV unit. Now Brett has much more design detail to follow. I used the QCAD drawing tool to complete a set drawings for all the machined parts required. Part dimensions were scaled off Brett's drawings. QCAD is beautiful application for generating 2 dimensional drawing and price is very reasonable at 24 Euros. Get the book too if you are new to Autocad type applications. 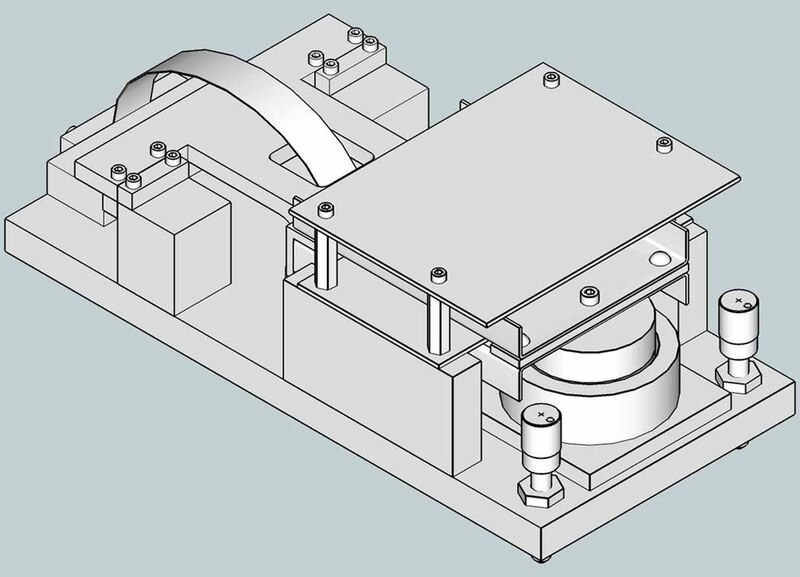 Once you get the 'hang' of how to use QCAD, you will be amazed how quickly one can put a drawing together suitable for a machine shop. 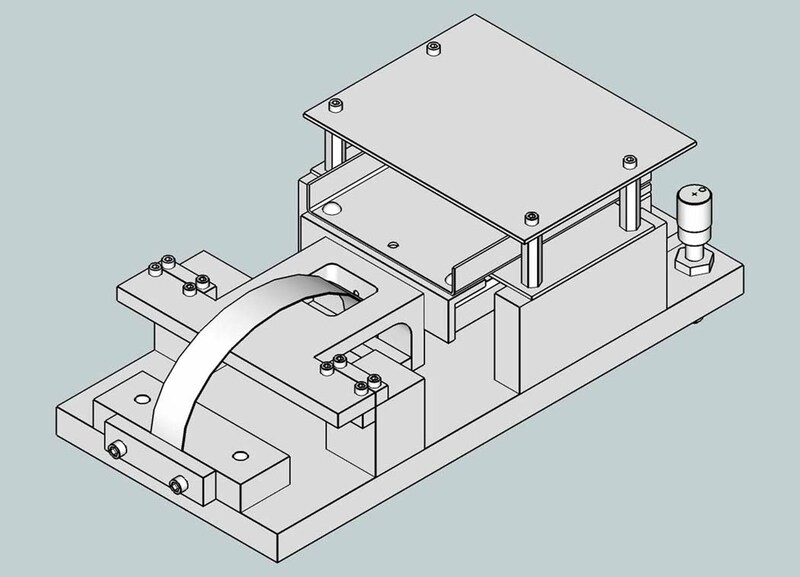 The hinges for the seismometer consist of 0.002" thick SS shim stock, .50" wide. My magnet was taller than the original Inyo unit so I had to make the vertical supports a little taller. That is about all I changed. I built the parts that needed a drill press and or band saw and went to a couple machine shops for the parts needing milling or sheet metal work on a brake. The parts were assembled and everything fit the first time. The spring is made from 17-7 stainless steel sheet and .012" thick. The weight of my coil or beam was heavier than Dave and Brett's and that meant the spring width needed to be wider too in order to support the beam. The width of the spring took a little cut and try and ended up to be .850" wide. A reasonable goal is to achieve around a 3 second pendulum period. It is useful to have a little trim mass to make small adjustments in the period without adjusting the spring length in the clamps. Don't spend too much time adjusting the period until the spring material has been heat treated. Heat treatment is a 900 degrees F. for one hour. I used my home oven in the 'Cleaning Cycle' for heat treating the spring material. The temperature of the oven was monitored with a T/C. Max temperature recorded was 880 degrees F. This seemed to be quite sufficient. After heat treatment the spring coefficient is slightly higher and is very stable with time, no creep. Next step, the electronics. Dave's PCB was partially assembled with just the components associated with measuring sensor plate position and power supplies. With these parts installed one could measure position sensitivity. The sensor plate position was measured with a dial indicator while the sensor circuit voltage was recorded and the sensor plate was moved over a plus/minus 0.030" distance. Notice the very linear output for more than plus/minus .010". 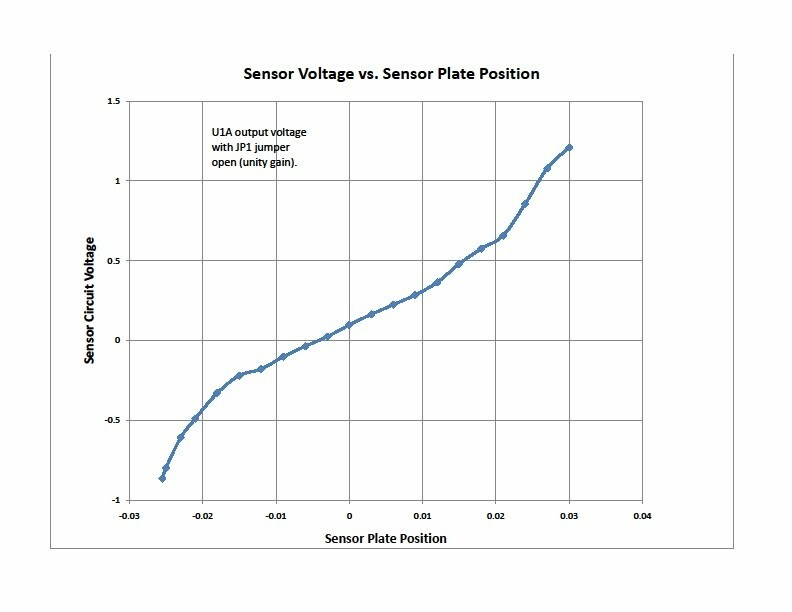 This raw sensor data calculates out to 1.24 volts/mm. We now know all the fixed mechanical parameters that we need to enter into Brett's 'loop7' spreadsheet. Loop7 spreadsheet is the integral tool needed complete the Inyo FBV seismometer and is used to determine the various resistor and capacitor component values for inserting in the printed circuit board. Now that you have the resistor and capacitor values for the PCB, now for assembling the board. Be sure to use the 'No Clean' solder. This solder has flux that does not leave a residue that could cause a leak path your high resistance resistors and high capacitance capacitors. Attach the PCB to your seismometer and connect the Signal A and Signal B outputs to your A/D converter. Next connect the DC voltage. But be sure you have the unit mounted on a very stable surface. I have mine resting on terra-cotta tile that is firmly cemented to a basement concrete floor. You also need to make sure you at least some sort of insulated box covering the seismometer to shield the unit from temperature variations and air movements. You have to do this, otherwise you just see a big mess, I know from experience. Below is a typical high-gain output with just an insulated box covering the unit. Notice the high noise content. Most of this noise is related to atmospheric buoyancy which effect vertical seismometers and can be corrected with an air tight container. Below is 45 minute FFT plot of the above response. As you see the peak energy is at 2 minutes with a secondary peak at 10 seconds. 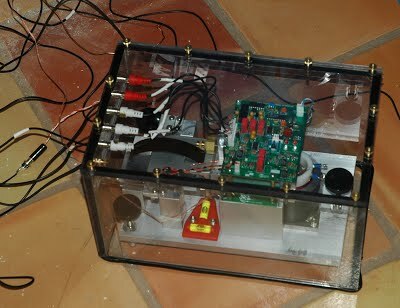 With this FBV seismometer, you really need a sealed case. About half way through the above 24 hour heliplot you will notice a flat line. At that point in time I stopped WinSDR and attached and sealed the cover on the airtight case protecting the FBV seismometer from atmospheric buoyancy effects. You will notice an immediate drop in the noise level. It seems to come back again a few hours later, but that was probably due to other noise sources such as the ocean surf about 50 miles away. 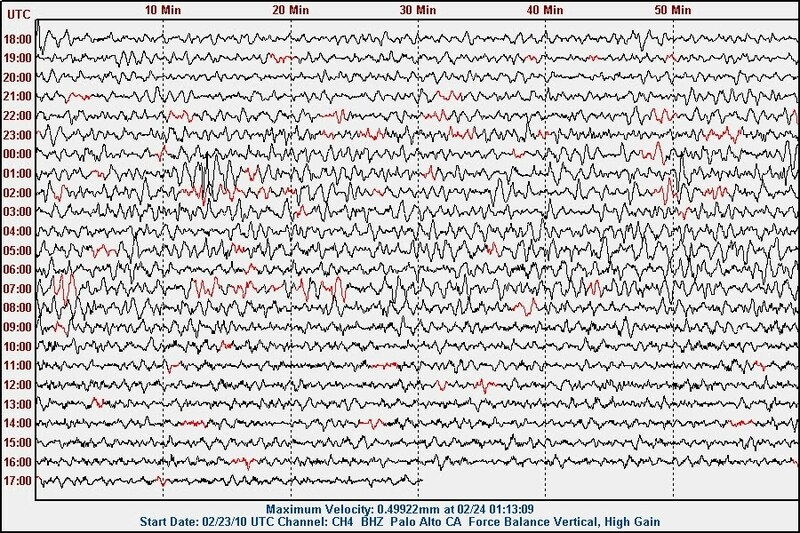 By the way at bottom of the display is the M5.9 quake that occurred in Nicaragua at 3:37UTC. That was 41 degrees away from Palo Alto CA. Below is 45 minute FFT plot of the above response. 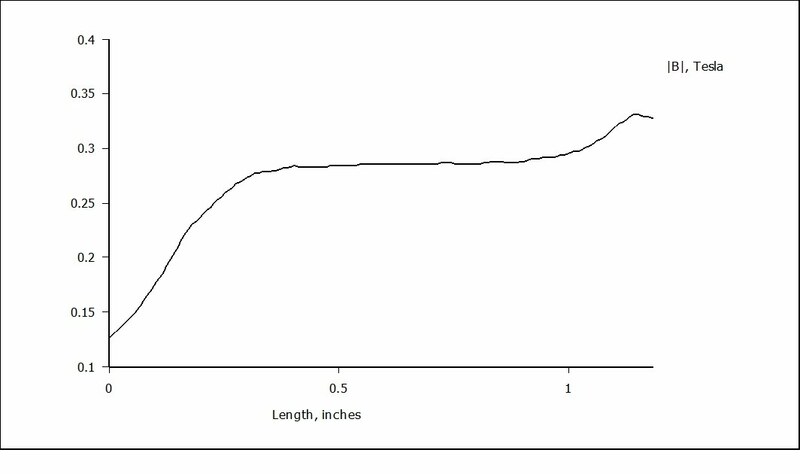 Notice the much different signature in FFT plot when the air tight case in place. Now the peak noise is at around 9 seconds and the 2 minute noise is much lower. The case was made from 3/8" thick polycarbonate plastic. 4-40NC thread stock was cemented into the edge of the cases's top edge with a spacing of about 3". There is also .062 thick rubber gasket that assures an air tight seal. The bottom of the box is open, but the edge is fitted with 3M Windo-Weld Ribbon Sealer that is 3/8" is diameter. This material is very pliable and somewhat sticky and easy to form an airtight seal to the floor. For the feed-thrus, I used RCA coax panel mount connectors and then used RCA coax cables to connect to the A/D converter.